Grilling delicious octopus is a 2 step process. First, you need to pre-cook the octopus by simmering it so that it becomes tender. You can do this a day in advance and allow the octopus to marinate in the refrigerator with some olive oil, salt, pepper, and lemon for more flavor. If you skip this step and grill the fresh octopus, you risk it being rubbery and tough. It is doable, but takes a skilled hand to get it right. 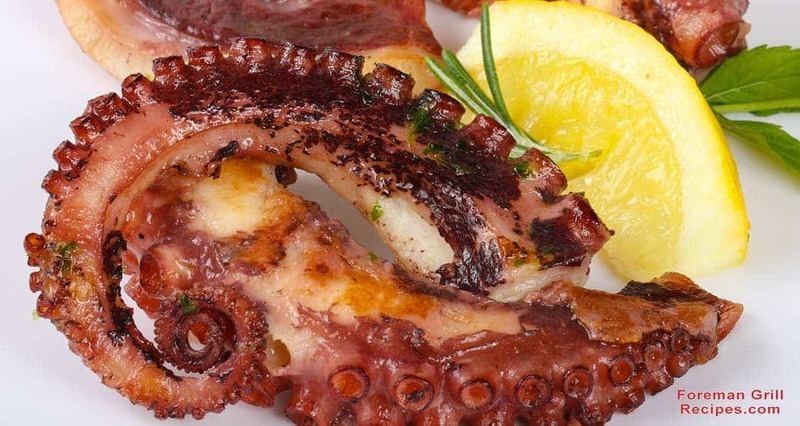 Octopus is a staple in the Mediterranean diet. The Italians and Greeks are masters at cooking it. The Mediterranean diet is touted to be one of the healthiest diets on the planet. It is rich with fruits, vegetables, seafood, olive oil, and red wine. Seafood is eaten more than red meat. It is full of good nutrition without the added trans fats. Octopus, in particular, packs a lot of nutrition. It is an excellent source of vitamin B-12 and iron. Both of these are necessary for the production of red blood cells. Octopus also has significant amounts of selenium, an important nutrient that aids in cell growth, boosts immunity, and is an antioxidant when combined with vitamin E. Antioxidants help our bodies fight damaging free radicals. One 3 ounce serving of octopus can supply you with 50% of the recommended daily amount of protein and a significant amount of omega-3 fatty acids that are essential for cardiovascular health. As mentioned before, this is a 2 step process, and well worth the effort for really tender and delicious octopus. 1. In a large pot, place the octopus, celery, bay leaf, garlic, peppercorns, 1 teaspoon of salt, and 1 lemon cut in half. Pour in enough water to cover. Turn the heat to medium-high and bring to a boil. Lower the heat to simmer, cover the pot, and allow the octopus to cook until tender. This will take approximately 60 minutes. You can check for tenderness with the tip of a sharp knife. 2. Remove the octopus from the water to a baking dish, discarding the aromatics and liquid. Coat the octopus with 1 tablespoon of olive oil. Cover with plastic wrap and place in the refrigerator for up to 24 hours. 3. Remove the octopus from the refrigerator to bring it to room temperature. Remove as much of any outer skin still attached as you can by rubbing your hands over the octopus. Don’t worry if it doesn’t come off. It will char when grilled. 4. Heat your Foreman Grill to high. Meanwhile, cut the octopus into serving sizes, approximately 4”. Coat with 1 tablespoon of olive oil and sprinkle with salt and pepper. Grill the octopus with the top closed just until the outside chars. This will happen quickly – approximately 3 to 5 minutes. Depending on your grill size, you will likely do this in batches. 5. Remove the octopus to a serving platter and brush with olive oil. Cut 2 lemons in half. Grill the lemon halves to lightly char. Serve the octopus with the grilled lemon. You can garnish with chopped parsley or oregano if desired. Grilled octopus can be served hot off the grill or at room temperature. It pairs nicely with a simple and refreshing Greek salad. Prepare this salad before grilling the octopus and let it sit in the refrigerator to marinate for several minutes. 1. In a serving bowl, prepare the vegetables, fruits, and cheese. Add the olives, salt, and pepper. Toss lightly. 2. Pour the olive oil and vinegar over the salad. Then, rub the oregano between your palms over the salad. Toss lightly to coat everything. While the grill is still hot, toast some pita bread to serve with the octopus and salad. Enjoy this meal with a glass of dry rosé wine. For dessert, serve some fresh sliced figs drizzled with a little honey or fresh red grapes, whichever are in season. This is a super healthy meal. Enjoy.